[162 Pages Report] The radio access network market constitutes the communication infrastructure, which helps establish the connection between mobile devices and the core network. The evolution in the connectivity technologies to introduce more advanced generations, such as 2G, 3G, 4G/LTE, and upcoming 5G, has led to the growth of the radio access network market. The radio access network market was valued USD 8.51 Billion in 2017 and is expected to grow at a CAGR of 8.7% between 2018 and 2023. The base year considered for this study is 2017, and the forecast period is between 2018 and 2023. 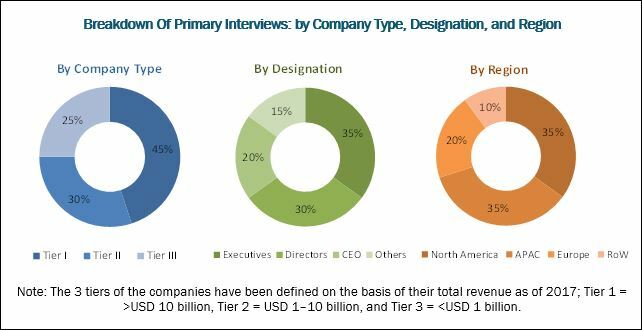 This report provides a detailed analysis of the radio access network market on the basis of communication infrastructure, connectivity technology, deployment location, and geography. The top-down and bottom-up approaches have been deployed to estimate the size of the radio access network market in the study. This entire research methodology includes the study of annual and financial reports of top players, presentations, and press releases; associations/consortiums such as Semiconductor Industry Association (SIA), Small Cell Forum, and Alliance for Internet of Things Innovation (AIOTI); paid databases such as Hoovers, Bloomberg Businessweek, Factiva, and OneSource; and interviews with industry experts. Also, the average region-wise revenue generated by the companies was used to arrive at the radio access network market size. This overall market size was used in the top-down procedure to estimate the sizes of other individual markets via percentage splits from secondary and primary research. Huawei (China), Ericsson (Sweden), Nokia Networks (Finland), ZTE (China), and Samsung (South Korea), among others, are the major players in the radio access network market. The radio access network market is estimated to be valued USD 9.88 Billion in 2018 and is projected to reach USD 14.99 Billion by 2023, at a CAGR of 8.7% between 2018 and 2023. The major factors driving the growth of this market are increasing mobile traffic, growing demand for improved network coverage, and technological advancements in the telecommunication industry. 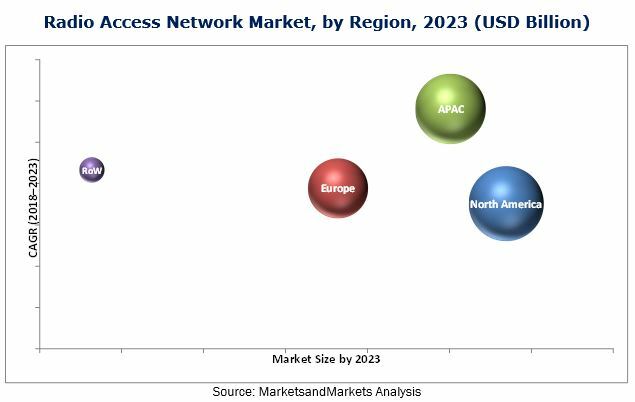 The radio access network market has been segmented on the basis of communication infrastructure, connectivity technology, and deployment location. In terms of communication infrastructure, small cell is expected to hold the largest share of the market by 2023. The growing demand for mobile data services driven by video streaming, photo sharing, and increasing use of online mobile applications as well as the increasing need of network densification are the major factors contributing to the high growth of the radio access network market for small cell. Of all the major deployment locations, urban areas held the largest share of the radio access network market in 2017. The need for enhanced data capacity and coverage in dense environments, such as city center zones, subways, and stadiums are the major drivers for the growth of radio access network market in urban areas. The radio access network market for the retail store deployment is expected to grow at the highest CAGR between 2018 and 2023. The requirement for higher automation, faster processing, and improved customer experience would propel the adoption of radio access network infrastructure in the future too, leading to the growth of the market for retail stores. The key restraining factor of the growth of the global radio access network market is the spectrum crunch and delay in the standardization of spectrum allocation. To meet the consumer demand, mobile operators are investing in new generations of mobile technologies, such as 4G and 5G, and are establishing more number of cellular base stations. In addition to the network upgrades, mobile operators also need access to a broad spectrum. High demand for capacity is impacting the availability of spectrum and has created a crunch. The radio access network market is highly competitive with a large number of global and local market players. Leading market players have adopted both organic and inorganic growth strategies to maintain a strong foothold in the radio access network market. Product launches and developments have been the most prominent strategies implemented by the key industry players in the recent years. Moreover, partnerships and collaborations are other major growth strategies deployed by the companies in the radio access network market. The key players following these strategies in the radio access network market are Huawei (China), NEC (Japan), Nokia Networks (Finland), Ericsson (Sweden), Samsung (South Korea), and ZTE (China), among others.